LONDON (March 1): The US dollar hit its highest in seven weeks on Wednesday as signs from two influential Federal Reserve policymakers that interest rates could rise this month overshadowed President Donald Trump's first major policy speech to Congress. New York Fed President William Dudley, a permanent voter on the US central bank's open market committee and close ally of chair Janet Yellen, said that the case for tightening monetary policy "has become a lot more compelling". That drove the return for holding US dollars on the debt market higher, with 10-year Treasury yields last up around 5 basis points at 2.411%. Money market futures were now pricing in almost a 70% chance of a rise in official interest rates in March, compared to just over 30% on Tuesday. 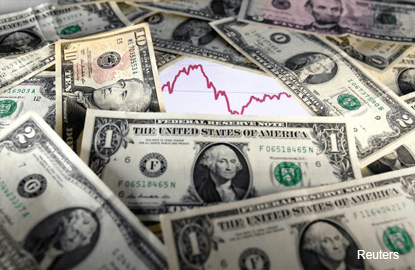 "The comments from other Fed officials this week have added to this relatively hawkish bias in rate markets and given the dollar some support," said Barclays strategist Mitul Kotecha. Tuesday's expectations that Trump would give details on stimulus plans that drove stellar gains in the US dollar in November were largely disappointed. In a speech that contrasted with harsher rhetoric during his election campaign, Trump said he was open to reforming the US immigration system and pledged massive tax relief for the middle class, but did not expand further. China's yuan, which has been a target for markets given Trump's previous aggressive talk on trade but which has risen for the past two months as the US dollar's rally stalled, was down just 0.2% on the day. The Mexican peso, seen as the most vulnerable to Trump's protectionist policies, also took his speech in stride. It was little changed at 20.066 per US dollar. "Today was 'good Trump' compared to the aggressive 'bad Trump' shown on Twitter," said Ayako Sera, market strategist at Sumitomo Mitsui Trust Bank. The greenback was last up 0.7% at 113.60 yen. It gained 0.3% against the euro to $1.0544, generating a roughly half percent rise in the dollar index, which measures the US dollar against a basket of six major peers.